We were sent a lovely set of Big CAT readers over a month ago and we have been loving them. We used the Tutankhamun’s Tomb book when we went to do a tomb painting workshop at the British Museum and the kids read the “Ancient Greeks Why They Matter To Us” before we went to our Ancient Greek workshop. We have enjoyed both books and they have been brilliant sources of information for the kids and importantly information that the kids can read and understand for themselves. Included in our lovely set of BIG CATS readers we also received a number of Shakespeare readers. We have just started reading about Shakespeare and I have been so impressed with this book – The Life and Times of William Shakespeare: Band 18/Pearl (Collins Big Cat) . The book is about Shakespeare’s life but they have manged to include so much general history about the time period in which he lived. I was not expecting this and I have found it fascinating. And it is not that they just mention who was on the throne. The book goes into much more detail, it talks about the ongoing tension between the Catholic and Protestant members of the royal family and it talks about events like Queen Elizabeth riding out on horseback to inspire her soldiers at Tilbury. The book goes into the background of Shakespeare’s parents and their home in Stratford-upon-Avon. And includes details like how Shakespeare’s farther planned to apply for his family coat-of-arms but could not due to financial issues and interesting facts about the schooling system of the time. I found these little bits of background information so enlightening. And the part about the clause in the lease which allowed them to move the theatre to another site – my kids were amazed by this and transporting it over the frozen Thames – Wow, no-one is going to forget that. It is these bits of information that bring this version of Shakespeare’s life alive and makes it so memorable. As the book goes through the different events in Shakespeare’s life it also highlights some of his work. It summaries a few of the most famous plays into about 2 pages each – Richard III, Romeo and Juliet, Hamlet, Macbeth and The Tempest. Although these are highly summarized explanations of the plays it is really useful to read the quick summaries and see how what he wrote fitted into the events of the times. I was really impressed with the style in which this book was written. The story of Shakespeare’s life is woven into the events of the time and then linked to the plays that he wrote. I think this reader makes a great introduction to Shakespeare for younger children and even for someone like myself who did study Shakespeare at school I found reading it and linking his writing to the events occurring around him fascinating and eye-opening. 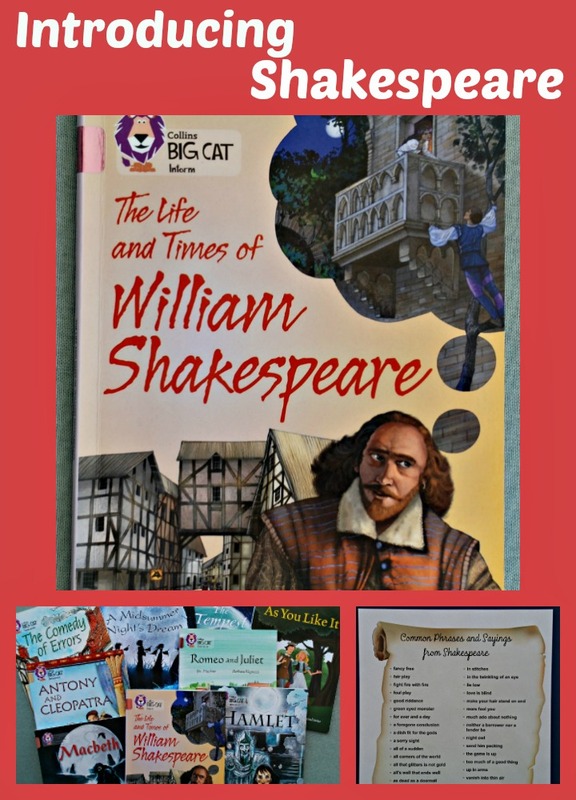 The Life and Times of William Shakespeare is one of the BIG CAT readers from Collins. Because it is part of a reading series it has been given a reading band which is Pearl Band 18 and is the last band in the reading series – so it would be Upper Key Stage 2 ages. We have only just started looking at Shakespeare and I have no doubt it is going to be a theme that we will study for years to come so I am sure I will be sharing more Shakespeare resources over time but for now I wanted to mention a few general items that we found on Activity Village. They have a lovely Common Phrases and Sayings from Shakespeare Poster (aswell as a worksheet for the kids to complete). And series of copywork pages all using famous lines out of Shakespeare’s plays. Both of these go well with a general discussion about Shakespeare, his works and how they even impact our current lives today. As I mentioned above Collins sent my kids a set of BIG CAT readers for them to use in our home education. All opinions expressed in this post are that of myself and my two little readers. We choose the readers that we wanted to feature in this post and other posts based on what we found useful as part of our home learning activities. We have been impressed with the quality of the BIG CAT reading series (both as readers and as informative historical books for the kids) and will continue to use them in other learning activities. The Activity Village worksheets are part of the membership package which is currently around £15 a year. I just included them as possible pages to use when looking at Shakespeare. I am not paid to include Activity Village pages in my posts. I do include Affiliate links in my posts. If you follow an affiliate link and go on to purchase that product, I will be paid a very small commission, however your cost will remain the same. I only include affiliate links for products that we use and love. 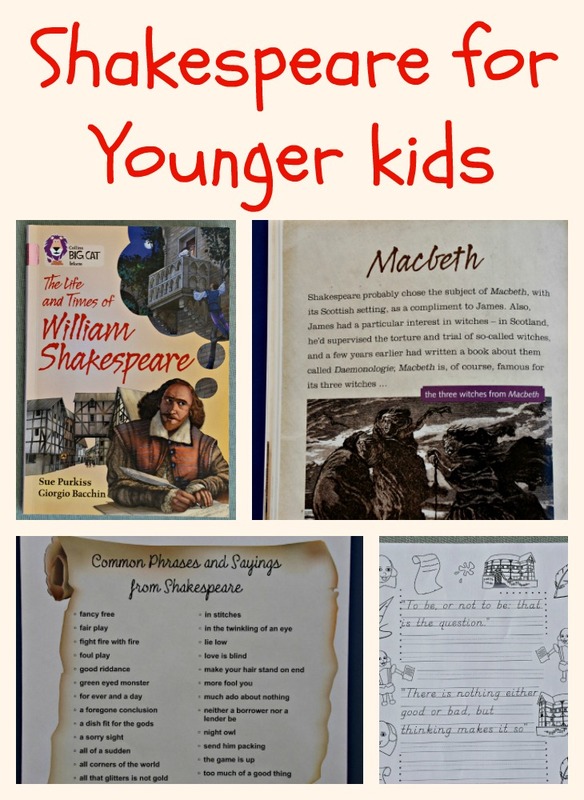 This entry was posted in English Ideas and tagged activity village, Big Cat readers, English Ideas, home ed, home education, homeschooling, Shakespeare. Bookmark the permalink. I am sooo impressed the depth you are going to with your subject matter…. it is far better than at any school I know…and your books are amazing …..the children are getting the very best education….